How a short story exposed the fiction of modern dating. 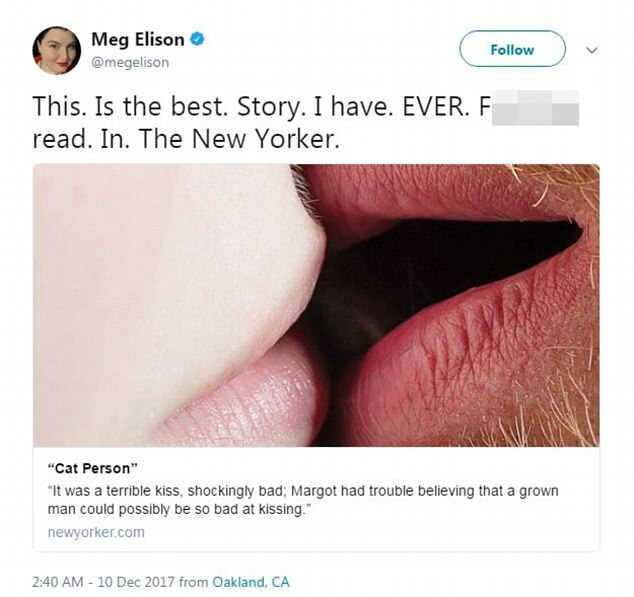 Cat Person has been a hot topic of online discussion over the past week, and has sat at the centre of an on-going social media outpour of emotive opinions. Readers of the piece have been divided in their reactions to Roupenian’s debut story to the publication, with critics slamming it for being more of an essay or article than work of fiction, while its fans sings the work’s praises for laying bare the stark realities many women are faced with when it comes to modern dating. To give a brief overview, and context, for those of you who have yet to read Cat Person (and I thoroughly recommend you do), the story follows the tentative, then uncomfortable romance between 20 year-old, college student, Margot, and her 34 year-old love interest, Robert. From first taking an interest in Robert while working at her job at the local, artsy movie theatre, she categorises him as being “Not so cute that she would have, say, gone up to him at a party, but cute enough that she could have drummed up an imaginary crush on him if he’d sat across from her during a dull class”. After surprising herself by giving Robert her (real) number upon his request, the pair, over the course of a few weeks, build up the bare bones of a relationship built on a shallow foundation of fabricated cats and a pattern of jokes shared with each other over the Christmas break, when Margot is visiting her family for the holidays. Aside from being an enjoyable read: as a short story, the prose itself is well written, engaging and provocative: Cat Person succeeds in shining a light on all-too relatable, and regrettable aspects of female experiences of dating in the age of Tinder and instant messaging. Specifically, the uncomfortable reality that young women are socially conditioned to not speak up when they feel uneasy. A fledgling relationship forged on the crumbs of face-to-face communication, and artificially strengthened through an intricate exchange of instant messaging, Margot and Robert’s relationship is vapid; superficial, in the sense that they know very little about each other, and have instead, projected an idealised image of what they want from a partner onto one an other- even after weeks of talking, Margot doesn’t even know Robert’s age. This trend in dating, is one which has grown all the more prevalent with the growth of popular online dating sites and apps, in that we are given a snippet of a bio about out potential partner, accompanied with a thumbnail photo, and are left to fill in the blanks ourselves; replacing the real-life potential date with a, to all intents and purposes, fictional character of our own. Cat Person depicts the manic-pixie-dream girl trope, as crafted by Roupenian, in a new form that manifests in this story in a very dangerous but realistic way. Margot, representative of countless women in similar scenarios, pushes for a falsified connection in a ritual akin to pushing a square peg into a round hole. Fed by her own fantasies, the protagonist has wrapped Robert in a shrine of her own creation, to the extent that she has convinced her self of the validity of her affection in an act of self-deception. In this pioneering work of fiction, Roupenian has achieved the rare magic that all authors aspire to create – to, through the written word, craft a piece of prose which provokes passion, discourse, and dialogue. Whether you find her likeable or not, the character of Margot mirrors that of many young women, adrift in this new, and unstable dating world of unread messages and missed calls, and the inherent inability to speak up for what we want in a society that teaches us to be accommodating and amenable.